The basketball star is looking to put his ‘Linsanity’ days behind him. Jeremy Lin says there’s no more Linsanity. He’s settling for Linteresting. Lin will debut with the Los Angeles Lakers next week as the 2014-15 NBA season gets underway. After two modest seasons with the Houston Rockets, Lin was traded to the Lakers in the offseason and now will get a chance to revive a career that began as a worldwide sensation with the New York Knicks in the spring of 2012. This is a critical year for Lin as he’s in the final season of a three-year, $25 million free-agent contract he signed to join the Rockets. After turning 26 in August, his NBA career is at a crossroads and this may be his last chance to prove he’s a star-quality point guard instead of a journeyman who should spend more time on the bench than on the floor. The Lakers, at this point in time, just might be the right place for Lin. The franchise is coming off one of the worst seasons in its history and expectations are low. The roster is a mish-mash of aging veterans and untested rookies and career backups. But there is some talent on the team and it could surprise some people. Despite the presence of Steve Nash, a two-time league MVP and future Hall of Famer, Lin likely will be the Lakers’ staring point guard when they open the season against the Rockets on Tuesday. Nash has been hampered by injuries the past two seasons and is hurt again after re-aggravating a nerve problem while carrying a travel bag. Byron Scott, in his first season as the Lakers coach, has all but anointed Lin as the starter because of Nash’s uncertain availability. Even without the latest setback, Nash was only going to play in 50 to 60 of the team’s 82 regular-season games. Lin will be playing alongside Kobe Bryant, who’s coming off an injury-plagued season of his own in which he appeared in just six games. Though Bryant has a reputation of being a ball hog, his advanced age and diminished athletic ability will make the Lakers backcourt more of a partnership where Lin will see more chances to handle the ball and take his shots. The change of scenery has already boosted Lin’s spirits. Born in the L.A. suburb of Torrance and raised in the Bay Area, Lin has always been popular with Asian-American fans in California. Now that he’s playing for the Lakers, it has reignited their passion for the storied franchise as well. Lin was traded to the Lakers during a weeklong trip to his parents’ native Taiwan, and immediately upon his return in July he was introduced to a throng of media – many from Chinese-language newspapers and television stations – at the Lakers’ facility in El Segundo, Calif.
Then during the Lakers’ media day to open training camp in early October, Lin was easily the second-most popular player at the gathering (behind Bryant, of course), where he was once again mobbed by dozens of reporters throughout the session. But if this reminded him of his heady days in New York during “Linsanity,” when he went from a virtual unknown to perhaps the most celebrated basketball player in the world – for a time his jerseys outsold that of Bryant, LeBron James, and everybody else – Lin quickly put that notion to rest. Lin says he’s more focused on building his basketball skills than building his brand. Though he’s still wildly popular in Asia and also in the Asian-American community in North America, he’s spurned many endorsement opportunities worth millions over the past couple of seasons. He does have a lucrative, undisclosed deal with Adidas, signed earlier this year after he made the switch from Nike. Known for his humility and self-deprecating humor, Lin instead produced a video on his lack of endorsement deals that’s become a huge internet sensation, in which he spoofed popular American TV commercials featuring Dos Equis beer and State Farm Insurance starring Chris Paul of the L.A. Clippers. Linteresting? For sure. 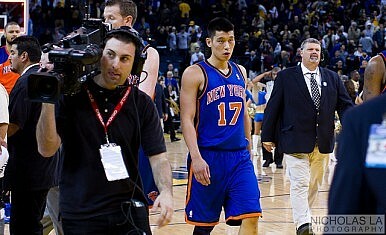 Linsanity? No more. The Asian-American superstar has spent most of his time on the Rockets’ bench.